Hours expand as money is raised, with the clinic open for two days a week in October 2002 and finally 40 hours a week in 2003 when Robert Wood Johnson Foundation steps up with a three-year matching grant for $300,000 a year. 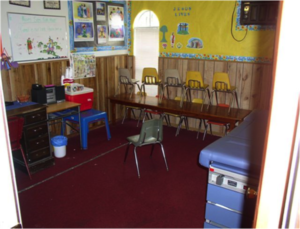 In 2003 the clinic has two nurse practitioners and three medical assistants who provide 2,100 medical to approximately 700 patients to the cramped Sunday school classrooms on the church’s second floor. Local donors match the funds from Robert Wood Johnson Foundation. One donor asks about the possibility of purchasing and remodeling the closed neighborhood tavern. Finding a new location becomes a priority.